The area's first settlers for thousands of years were Native American cultures and historic tribes. 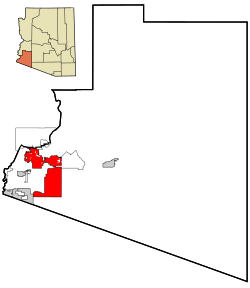 Their descendants now occupy the Cocopah and Quechan reservations. Following the United States establishing Fort Yuma, two towns developed one mile down river. The one on the California side was called Jaeger City, named after the owner of Jaeger's Ferry, which crossed the river there. It was for a time the larger of the two, with the Butterfield Overland Mail office and station, two blacksmiths, a hotel, two stores, and other dwellings. The other was called Colorado City. Developed on the south side of the river in what is now Arizona by speculator Charles Poston, it was the site of the custom house. When started, it was just north of the border between Mexican-ruled Sonora, Mexico and California. After the Gadsden Purchase by the United States, the town bordered on the Territory of New Mexico. This area was designated as the Territory of Arizona in 1863. The Colorado City site at the time was duly registered in San Diego; both banks of the Colorado River just below its confluence with the Gila were recognized as being within the jurisdiction of California. The county of San Diego collected taxes from there for many years. From 1853 a smaller settlement, Arizona City, grew up on the high ground across from the fort and was organized under the name of its post office in 1858. It had adobe dwellings, two stores and two saloons. Colorado City and Jaeger City were almost completely destroyed by the Great Flood of 1862 and had to be rebuilt on higher ground. 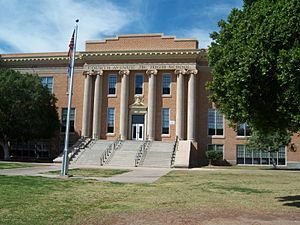 At that time Colorado City became part of Arizona City. It took the name Yuma in 1873. From 1854, Colorado City was the major steamboat stop for traffic up and down the Colorado River. 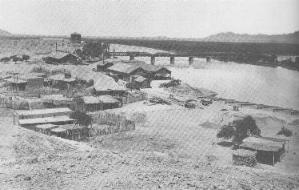 After the 1862 flood, it became part of Arizona City. 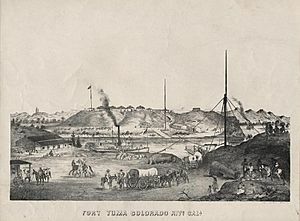 The steamboats transported passengers and equipment for the various mines and military outposts along the Colorado; Colorado City was the terminus of wagon traffic up the Gila River into New Mexico Territory. They offloaded the cargo from ships at the mouth of the Colorado River at Robinson's Landing and from 1864 at Port Isabel. From 1864, the Yuma Quartermaster Depot, today a state historic park, supplied all forts in present-day Arizona, as well as large parts of Colorado and New Mexico. After Arizona became a separate territory, Yuma became the county seat for Yuma County in 1871, replacing La Paz, the first seat. 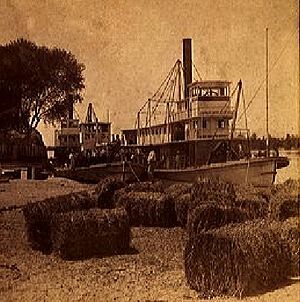 The Southern Pacific Railroad bridged the river in 1877, and acquired George Alonzo Johnson's Colorado Steam Navigation Company, the only steamboat company on the river. Yuma became the new base of navigation on the river, ending the need for Port Isabel, which was abandoned in 1879. The warehouses and shipyard there were moved to Yuma. Yuma is located near the borders of California to the west and Mexico to the south, and just west of the Gila River's confluence with the Colorado. The city is approximately 60 miles from the Gulf of California (Sea of Cortez), a branch of the Pacific. According to the United States Census Bureau, the city has a total area of 106.7 square miles (276 km2), of which 106.6 square miles (276 km2) is land and 0.1 square miles (0.26 km2) (0.07%) is water. Yuma is noted for its weather extremes. 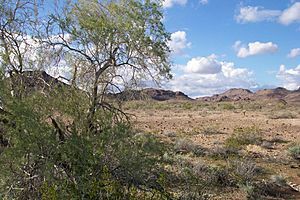 Of any populated place in the contiguous United States, Yuma is the driest, the sunniest, and the least humid, has the lowest frequency of precipitation and has the highest number of days per year–175–with a daily maximum temperature of 90 °F (32 °C) or higher. Yuma features a hot desert climate (Köppen climate classification BWh), with extremely hot summers and warm winters. Atmospheric humidity is usually very low except during what are called "Gulf surges", when a maritime tropical air mass from the Gulf of California is drawn northward, usually in connection with the summer monsoon or the passage of a tropical storm to the south. On average, Yuma receives 3.36 inches (85 mm) of rain annually. Even in the wettest year of 2005, only 7.39 in (188 mm) fell. The driest year at Yuma Airport has been 2007, with only 0.15 in (3.8 mm) recorded. September is the wettest month of the year, while June is the driest. In 1995, Yuma reached its all-time high of 124 °F (51 °C). The lowest recorded temperature was −6 °C (21 °F) on the Yuma-Mesa area in January 2007. The temperature fell to −6 °C (21 °F) for approximately two hours and harmed many crops grown in and around Yuma. The crop that suffered the most damage was the citrus on the Yuma mesa, most notably the lemon crop. It suffered a 75% to 95% loss of crop and trees, as stated by the Arizona Department of Agriculture in a February 2007 report. On average, the temperature lowers to the freezing mark in less than a quarter of years, and there are 118 days per year that reach or exceed 100 °F (38 °C), usually from April through October. During July and August the temperature fails to reach the century mark on at most, only a few days. In 1997, the desert city sustained a full tropical storm after Hurricane Nora made landfall at the mouth of the Colorado River and quickly moved due north along it. This rare event cut power to 12,000 customers in Yuma, and dropped 3.59 inches (91 mm) of rain at Marine Corps Air Station Yuma. The last time a hurricane had hit near Yuma was in mid-August 1977, when similar falls were recorded. As of the census of 2000, there were 77,515 people, 26,649 households, and 19,613 families residing in the city. The population density was 726.8 people per square mile (280.6/km²). There were 34,475 housing units at an average density of 323.3 per square mile (124.8/km²). The racial makeup of the city was 68.3% White, 3.2% Black or African American, 1.5% Native American, 1.5% Asian, 0.2% Pacific Islander, 21.4% from other races, and 3.9% from two or more races. 45.7% of the population were Hispanic or Latino of any race. There were 26,649 households out of which 38.8% had children under the age of 18 living with them, 56.6% were married couples living together, 13.1% had a female householder with no husband present, and 26.4% were non-families. 21.7% of all households were made up of individuals and 9.8% had someone living alone who was 65 years of age or older. The average household size was 2.79 and the average family size was 3.27. In the city, the population was spread out with 29.6% under the age of 18, 11.9% from 18 to 24, 27.1% from 25 to 44, 17.5% from 45 to 64, and 13.9% who were 65 years of age or older. The median age was 31 years. For every 100 females there were 99.1 males. For every 100 females age 18 and over, there were 97.2 males. According to the 2006 American Community Survey estimate, the median income for a household in the city was $39,885, and the median income for a family was $41,588. Males had a median income of $35,440 versus $27,035 for females. The per capita income for the city was $18,393. About 14.1% of families and 16.9% of the population were below the poverty line, including 23.4% of those under age 18 and 13.9% of those age 65 or over. High unemployment remains an issue in Yuma. Citing April 2014 data, the Bureau of Labor Statistics ranked Yuma as having the highest unemployment rate in the United States at 23.8 percent, above the 21.6 percent in El Centro, California. Yuma's agricultural workforce, which adjusts to the picking season, is cited by the Arizona Department of Commerce as the reason for the apparent high unemployment. 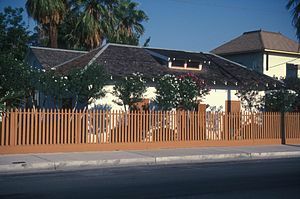 Yuma contains the historical Yuma Territorial Prison, the Yuma Quartermaster Depot State Historic Park (formerly known as the Yuma Crossing Historic Park), and a historic downtown area. Yuma is an Arizona Main Street City. Because of budget cutbacks at the state level, Arizona State Parks no longer operates the Territorial Prison and Quartermaster Depot. They are now operated by the Yuma Crossing National Heritage Area and the City of Yuma. 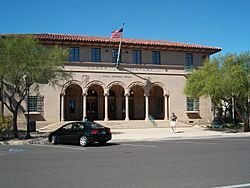 The Yuma Visitors' Bureau oversees the Welcome Center at the Quartermaster Depot and is the official visitors' center for the Yuma Community. Near Yuma are the Kofa Mountain Range and wildlife refuge, Martinez and Mittry Lakes, and the Algodones Dunes. The city is the location of the Marine Corps Air Station Yuma, which conducts an annual air show and many large-scale military exercises. There is also the Yuma Proving Ground, an Army base that tests new military equipment. Yuma Proving Ground is also home to the Special Operations Free Fall School, which provides training in free-fall parachute operations to Special Forces units in all branches of service, as well as those of other nations. The Colorado River runs along the north and west side of town, serving as the border between Arizona and California. Yuma is an important station for trucking industry movement of goods between California, Arizona and Mexico. The Rialto movie theatre once owned a Kilgen pipe organ, one of the most expensive pipe organs to have been made. Originally played as accompaniment to silent films, it has been moved to the Yuma Theatre. Every February residents and visitors enjoy the annual rodeo, the Yuma Jaycees Silver Spur Rodeo. A parade opens the events. Cowboys and cowgirls from all over the country compete in the festivities. The Yuma County Fair takes place annually in the spring at the fairgrounds in Yuma. Yuma, Arizona Facts for Kids. Kiddle Encyclopedia.